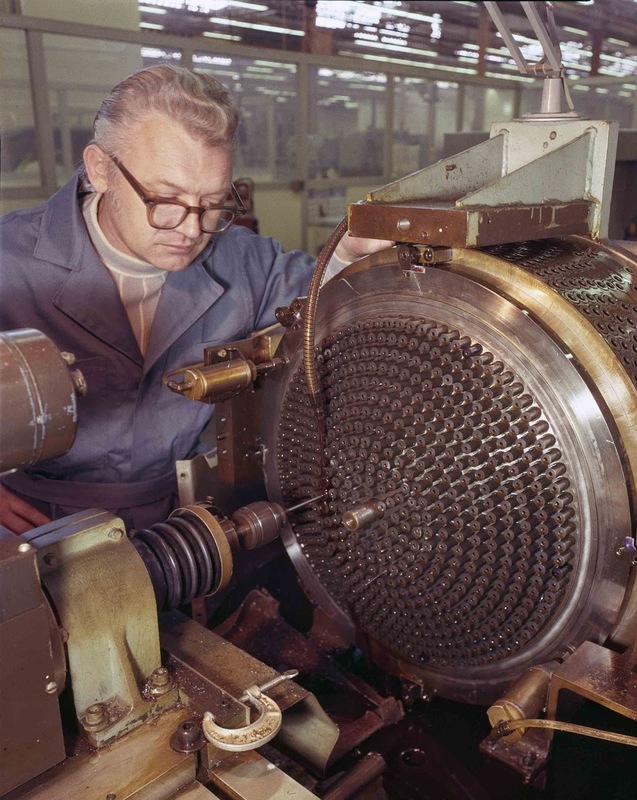 Machining a Space Shuttle Main Engine injector, 1977. A workman reams holes to the proper size and alignment in the Space Shuttle Main Engine’s main injector body, through which propellants will pass through on their way into the engine’s combustion chamber. Rockwell International’s Rocketdyne Division plant produced the engines under contract to the Marshall Space Flight Center. Not only does this image give us a glimpse into NASA’s past, but it also illustrates just how far machining technology has come over the past four decades. Each of those injector nozzles is a separate piece; what we see in the picture is the whole assembly, with each of the nozzles poking through the “primary plate”. In all likelihood the injectors are prefabricated with a slightly undersized hole, pressed into the plate and reamed out to final size in this setup. Developed in the 1970s by the Marshall Space Flight Center, the Space Shuttle Main Engine was the world’s most sophisticated reusable rocket engine. The space shuttle’s three main engines operated for 8 minutes and 40 seconds for each shuttle flight, with a combined output of 37 million horsepower. At their full power, that was equivalent to the output of 13 Hoover Dams. After the solid rockets were jettisoned, the main engines provided thrust which accelerated the shuttle from 3,000 mph to more than 17,000 mph in just six minutes to reach orbit. They created a combined maximum thrust of more than 1.2 million pounds. As the shuttle accelerated, the main engines burned a half-million gallons of liquid propellant provided by the external fuel tank. Each main engine was 14 feet (14 m) long, weighed approximately 7,000 pounds (3.5 tons) and was 7.5 feet (2.4 m) in diameter at the end of its nozzle. It operated under temperatures ranging from −253 °C (−423 °F) to 3300 °C (6000 °F).